Are you looking for a fragrance for the spring and summer time of the year? If you are a woman with a cheerful personality, this fragrance is perhaps just what you are looking for. Here, we will introduce you to Marc Jacobs Daisy, a fragrance that is widely loved because of the sparkly floral scent. It is both fresh and feminine, devoted to all the sophisticated, seductive, dazzling women. Despite the nice character, Marc Jacobs Daisy is actually quite a simple scent. It is a perfect choice for a bright, sunny day. The packaging of this perfume has stated clearly that this is one floral scent. The box is colored in black, with white petals decorating the edges. The names Daisy and Marc Jacobs are embossed in a golden font on the front side of the box. The rather simple box has a mysterious air around it, and it is actually hiding such a stylish and elegant bottle inside. The bottle looks premium and luxurious. The cap features beautiful white daisy petals, even though the scent actually does not have any daisy accord. More on that later. The bottle is translucent. The names Daisy and Marc Jacobs are once again written on the bottle, this time in a black font. The bottle looks sparkling and beautiful. 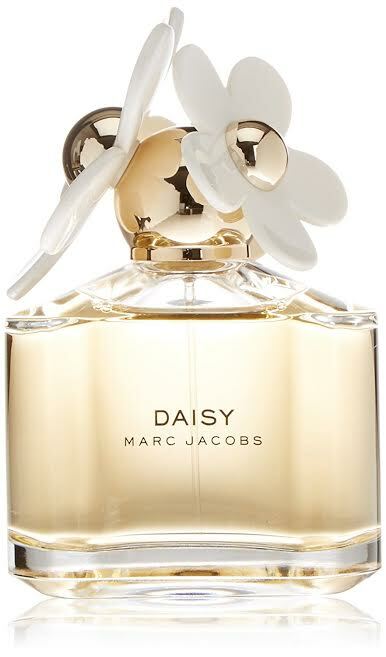 As we mentioned before, Marc Jacobs Daisy actually does not have any daisy accord in it. However, it indeed gives an excellent imaging of white flowers. Upon sniffing it, you will be presented with the images of a girl in white dress dancing around a field of white flowers under the bright, blue skies. The scent appears cheerful, playful, happy, fun, and innocent. It is not a complex scent; it is rather simple, and it is straight-up floral. Marc Jacobs Daisy opens with the somewhat citrusy top notes of violet leaf, grapefruit, and strawberry. Very charming and refreshing. The heart notes are sweet and floral, featuring violet, gardenia, and jasmine. Meanwhile, the base notes provide a solid and slightly woody aroma. The base notes consist of musk, white wood, and vanilla. However, the sillage of Marc Jacobs Daisy is somewhere between soft to moderate. The scent does not radiate over an arm’s length. So, this is a nice perfume if you want to be confident without making the whole room turning their heads to you. The longevity is moderate; it lasts for a few hours, but you may need to re-apply the fragrance if you want it to last for a full day. Check the best price of Marc Jacobs Daisy here!